Cherry tomatoes, sliced cucumber, and parsley tossed in water; image by Sonchia, via Pixabay.com, CC0. The student life is a busy one, but not so busy that healthy nutrition is impossible. All it takes is the right tools and a trip to the grocery store. Did you know that you established food preferences during early childhood? You love pizza because you loved pizza night with your parents. You loved the moments when they took you out at McDonald’s. But as you moved towards adolescence, you started making independent choices regarding your food. You bought your own meals, and fast food was the easiest option. As a part of college student life, you made yet another transition: you started choosing food that’s easy to buy and quickly makes you feel full. Pizza, burgers, potato chips… all that’s greasy and unhealthy somehow finds its way onto your plate. It’s not all frozen food and fast food orders for students. It’s also alcohol. The Student Living Index 2018, a survey focused on the cost of living at UK university, found that alcohol and eating out were the biggest expenses for students after food, toiletries, and bills. Let’s take a look at a research article that sheds light on the issue: adolescents in the U.S. are guilty of low physical activity along with several additional negative health behaviors, such as low fruit and vegetable intake, cigarette smoking, and marijuana use. If you belong in that category, it’s time to change that. Some habitual behaviors are difficult to affect. Giving up on cigarettes, for example, requires strength of character and an adaptation period. But by introducing healthy eating habits, you start affecting your health without feeling deprived. Instead of trying to eliminate the bad habits all at once, start thinking this way: you’ll introduce new, healthy eating habits in your lifestyle. With time and effort, you’ll abandon the bad habits without even noticing. Let’s focus on the food, shall we? Is it possible to start eating healthy without much effort? It is! We’ll give you three simple cooking tips that you can start implementing today. 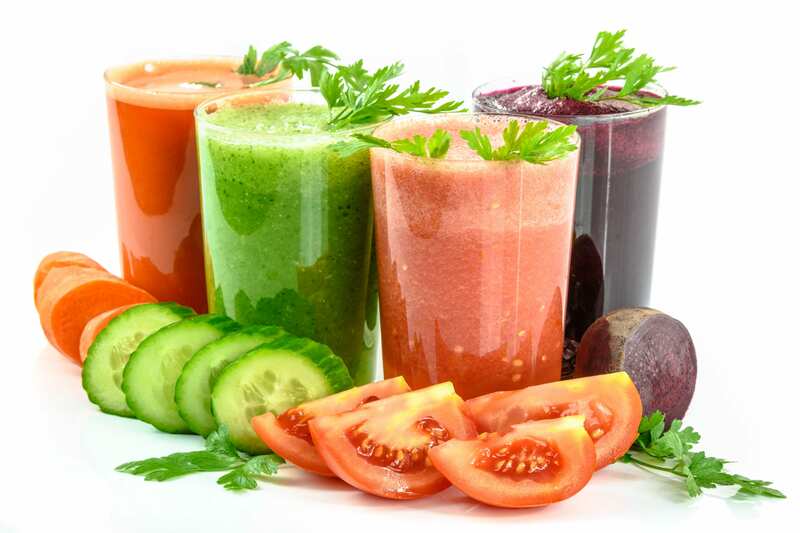 Four glasses of various fresh juices, surrounded by cut vegetables; image via PxHere.com, CC0. If you’re going to invest in your health, a high-quality juicer is the best investment you could ever make. It’s important to choose a slow juicer, since it extracts more juice and nutrients when compared to the fast juicer. The slow one doesn’t have knives. It squeezes the fruit and doesn’t damage the nutrients in any way. This is your first cooking tip: make some juice as soon as you wake up. Before you do anything else, get your fruits and veggies ready. On an empty stomach, your body will be able to process the nutrients much more easily. You’ll get plenty of vitamins and minerals, as well as enough energy to face a challenging day. Carrots + beetroot + apples = juice full of iron, vitamin A, vitamin K, and vitamin C.
Pineapple + spinach = an easy way to make spinach tasty. Pomegranate + kale + blueberries = an amazing antioxidant. The best thing about juices is that they are tasty! When you use a slow juicer, the juice won’t separate, so you can easily take a bottle with you. You’ll have your energy bomb in between classes. How will you get protein in your diet if you don’t cook? How can you cook a complete meal when you don’t have time for it? You’d have to make some sacrifices, such as hiring a cheap custom essay writing service to help with the papers while you prepare your daily meals. But wait! Sacrifices are not necessary when you get a slow cooker. You just throw some ingredients in, turn it on and allow it to do its job. You can even set it up to cook your food while you’re at class. If you get a smart slow cooker, you’ll control it with your smartphone. You’ll always go home to a warm, home-made meal. How cool is that? It’s energy-efficient and easy to use. Plus, it gives you tons of opportunities to experiment with food. You can make beef stew, beans, chicken and rice, and many other meals that are easier to prepare than you think. If you buy your meat from the butcher’s, you can get cheaper deals and you’ll always be sure that it’s fresh. Boil some rice. You’ll just boil water and follow the instructions on the package. It usually takes 11-15 minutes. Add tomato, cucumber, canned peas, boiled eggs, and a can of tuna (in olive oil). There you have it – a salad that can substitute a complete dinner. Prepare buckwheat or quinoa. That’s easy; you just boil it just like you did with the rice. Add tomato, cucumber, avocado, and some salt. When you start experimenting with salads, you’ll unleash your creativity. Just get some fresh ingredients, add a filling ingredient such as rice, buckwheat, quinoa, or chicken meat, and voila – you have a lovely meal that took less than half an hour to prepare. In its essence, healthy food doesn’t complicate your life. Fast food does! The best part is that it’s easy to start making better choices as soon as you decide to do so. You only need a juicer, slow cooker, and fresh produce. Oh, and a commitment to a healthier lifestyle. You’ll start with the food, upgrade to some exercise, and you’ll be ditching bad habits before you know it. Samantha R. Gilbert has been working as a journalist at an online-publishing agency in New York, USA for two years. She is also a professional writing expert in such topics as blogging, modern art and education. Meet Samantha on Twitter.